My favorite holiday is Christmas, and in the midst of typing this, I am preparing to put away all of our fall decor and replace it with our Christmas decorations. When I was offered the opportunity to receive and review this DVD series by Tyndale, I was ecstatic! I am always wanting to learn more about the true meaning the holiday I adore so much. This DVD series contains 4 episodes on 2 different discs. Each episode takes the viewer through the various places and customs of the places important to the Christmas story. 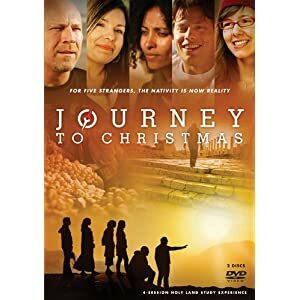 The narrators of this series are5 individuals, all from quite different backgrounds:an artist, Christian, agnostic, talk show host, and a Native American. Each individual journeys to Israel for different purposes, but all with the mission to learn more about the birth of the King. The video content of the DVD was very well done! Is is definitely of professional quality and is not your typical amateur documentary. I also really enjoyed the tour guide for the video as he showed the places, history, and customs. As my husband was watching the video with me one night, he commented on the fact that he had never thought to consider what Mary and Joseph might have eaten, which was thoroughly depicted in the video. For me personally, I was not in love with this video series. For one thing, you can tell this was made to be broadcast on the television, as there are awkward breaks throughout each episode. Secondly, I was not a huge fan of the different individuals giving their personal impression of what was going on throughout their journey. I think this video would have been much better had it included simply a tour guide though the holy land with out the additional commentary. There is not much Christian content in this video, which was also discouraging. If this were free on T.V., I would more than likely watch it, but I would not want to purchase it for my personal use in my home. I think watching it one time would be enough.